I fancied getting my stamping on when cardmaking recently. I love all the Stampin’ Up cards with the ink splodge stamps but never fancied stumping up the cash for their stamps. After finding something similar recently I pulled together a quick card to try it out. I loved the concept for this card, it was simple and cute. The sentiment stamp and dashed heart (which came from a different stamp set) went together well. The balloon probably didn’t need to be coloured in but was nice enough. The only probably was my new circles stamp. It looked so splodgey! 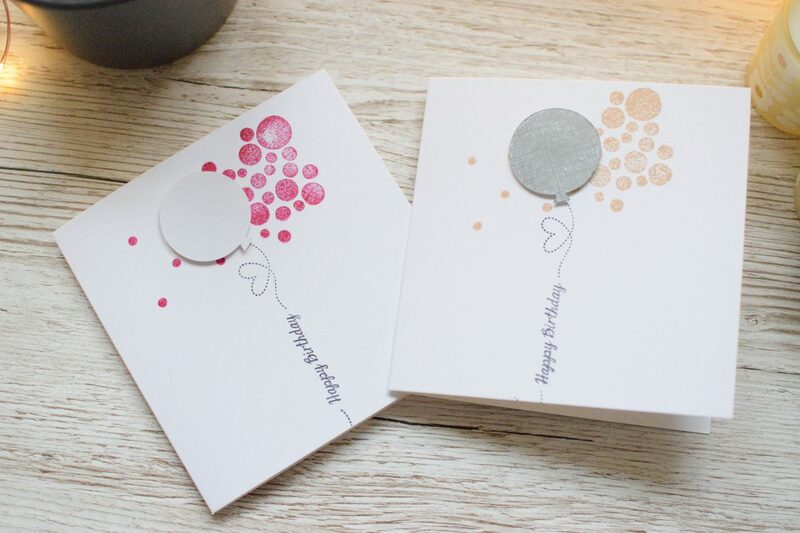 Hopeful that I hadn’t bought a dud stamp, I tried the card again, this time using the same brand of ink for the circles as I did for the sentiment. While the circles aren’t 100% filled in the overall quality is much better. You can see the ink has transferred pretty consistently . All I need to do is load up the stamp with more ink and will have a perfect image. When picking out inks for the card it hadn’t even occurred the difference the inks could have. I just picked out one of my Dew Drop Memento Inks, as I love the colour selection of those. Little did I know that dye inks aren’t too great for stamps like my circle one. It’s all about the solvent inks instead. I’ve had the black StazOn ink for a while. The red was a new addition and this was the first time I’d used it. While I’m not going to ditch the dew drop inks completely, I need to pick and choose what I use them for. If you’re stamping a large image or something like a sentiment a solvent ink is definitely the way forward. The only problem with using the StazOn inks is the colour selection. It’s pretty poor. Thankfully, I’ve found a range of midi sized StazOn ink pads in a nicer selection of colours. I managed to find them on eBay for a not-too-horrific price of £4 each. One thing to watch out for though with solvent inks is how much they can dye your stamps. This was my stamp after using it just once with the red ink. I could probably have cleaned it better but I’ve never successfully got solvent ink completely off a stamp. I’m definitely getting more confident with my stamping. I used to avoid it because it always seemed to go wrong. But now I’m building up a nice little collection of good quality stamps, and some very good inks I’m going to use them a lot more. This is something I pulled together for my aunt’s birthday in the same cardmaking session. This Avery Elle stamp works so well here! If only I could find scrapbooking sized sheets of that beautiful My Mind’s Eye paper. How do you get on with stamps? Is it a love/hate relationship too or are you finding your way with them? Let me know in the comments below!